An activity in listening to a description of something and then drawing it. 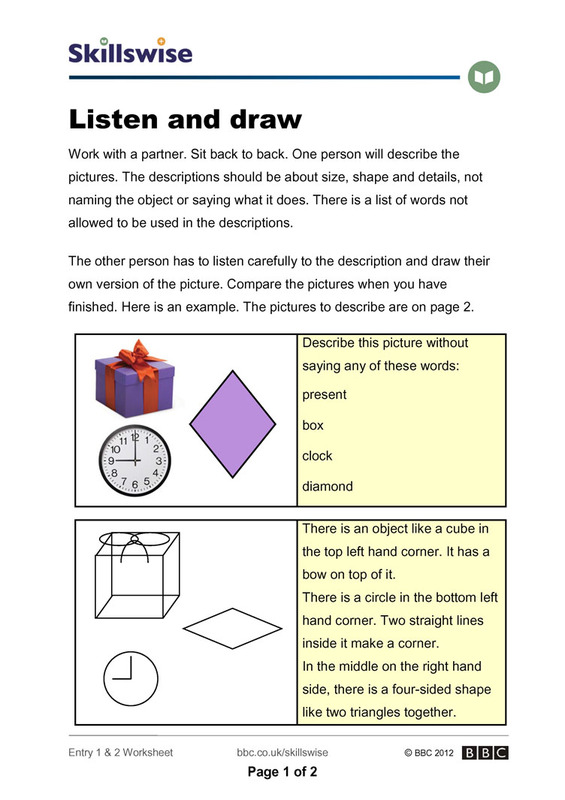 This worksheet is designed to work with two learners: one who will describe and one who will draw. They need to be positioned so the person drawing can’t see the images (e.g. back to back). Learners may need support reading instructions; tutor could model first with volunteer. Key instruction is that players don’t describe the object at all: drawing instructions are just technical – directional, positional, related to shape and line description. This activity (often done at work ‘away-days’ and ‘bonding days’) shows how important clear instructions are, listening carefully to the detail of instructions, and knowing when to ask for clarification. Shows that effective speaking and listening is the essence of teamwork. Alternatively, tutors may wish to read out the instructions to a learner (or large group) for them to draw. The comparison of the finished drawings with both the original and other learners will lead to useful discussions on the details people picked up on. Extension activities might include listening to other instructions and analysing how well they are followed (e.g. giving directions verbally and seeing if someone is able to meet you at the intended location).